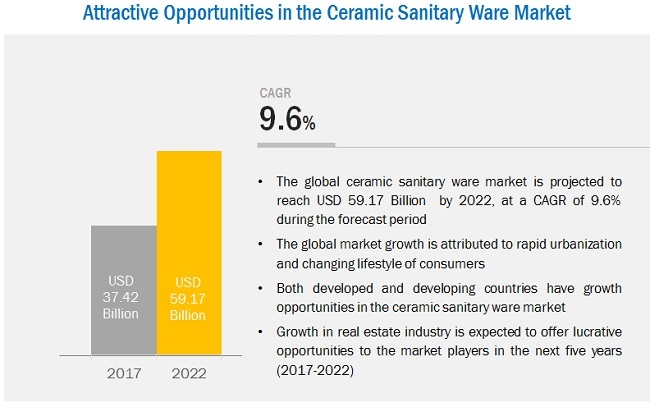 [158 Pages Report] on Ceramic Sanitary Ware Market is estimated to be USD 37.42 Billion in 2017 and is projected to reach USD 59.17 Billion by 2022, at a CAGR of 9.6% from 2017 to 2022. In this report, 2016 is considered as the base year and the forecast period is from 2017 to 2022. This research study involves the extensive use of secondary sources, directories, and databases (such as Hoovers, Bloomberg BusinessWeek, and Factiva) to identify and collect information useful for this technical, market-oriented, and commercial study of the ceramic sanitary ware market. The primary sources mainly include several industry experts from core and related industries and preferred suppliers, manufacturers, distributors, service providers, and organizations related to all segments of the industry’s supply chain. After arriving at the overall market size, the total market has been split into several segments and subsegments. The figure below illustrates the breakdown of primary interviews based on company type, designation, and region conducted during the research study. The ceramic sanitary ware market is competitive, owing to a large number of established and local players. Key players operating in this market include Roca Group (Spain), LIXIL Corporation (Japan), Toto Inc. (Japan), Geberit Group (Switzerland),and HSIL (India), among others. These players are focused on investing in the development of eco-friendly products to maintain their strong foothold in the market. This report categorizes the ceramic sanitary ware market based on type, application, technology, and region. 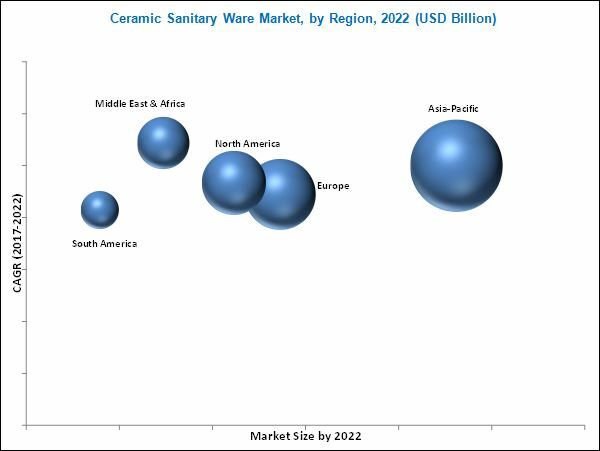 The ceramic sanitary ware market is projected to reach USD 59.17 Billion by 2022, at a CAGR of 9.6% from 2017 to 2022. Increase in the manufacturing of sanitary ware products, rise in disposable income of the middle-class population in Asia-Pacific and the Middle East & Africa, and expansion of the infrastructure industry are key factors driving the growth of the ceramic sanitary ware market. The growth of the real estate and hospitality sectors is another significant factor propelling the demand for ceramic sanitary ware products. The ceramic sanitary ware market in the European and North American regions is expected to witness slow growth due to saturation of end-use applications. On the basis of type, the ceramic sanitary ware market has been segmented into five major categories, namely, wash basins, toilet sinks/water closets, urinals, cisterns, and others. Toilet sinks/water closets is projected to be the largest type segment of the ceramic sanitary ware market, in terms of value and volume. Various government initiatives undertaken to improve sanitation and hygiene in emerging economies are anticipated to drive the demand for various types of sanitary ware products. On the basis of application, the ceramic sanitary ware market has been broadly categorized into commercial and residential. The commercial segment has been further subsegmented into office, institutional and retail, industrial, and hospitality, whereas, the residential segment has been further classified into single family and multi-family. The hospitality subsegment accounted for the largest share of the commercial application segment. This large share is mainly driven by the increasing trend of domestic and global travel. On the basis of technology, the ceramic sanitary ware market has been classified into four major types namely, slip casting, pressure casting, tape casting, and isostatic casting. Slip casting is the largest technology segment of the ceramic sanitary ware market, owing to factors such as low capital investments, homogenous production, and adaptability to complex designs. The Asia-Pacific was the largest market for ceramic sanitary ware in 2016. Infrastructural developments in this region have led to an increase in demand for ceramic sanitary ware products across residential and commercial applications. The growth of the real estate sector in the Asia-Pacific region has further contributed to the rising demand for ceramic sanitary ware products in this region. Furthermore, the presence of established consumer appliance manufacturers such as LIXIL Corporation (Japan), Toto Inc. (Japan), and HSIL (India) has supported the growth of the ceramic sanitary ware market in the Asia-Pacific region. Increasing environmental concerns regarding toxic emissions generated during the production of ceramic sanitary ware products are acting as a restraint to the growth of the market. In contrast, the growing demand for ceramic sanitary ware products from the Southeast Asian countries provides lucrative growth opportunities for stakeholders in this market. Leading manufacturers of ceramic sanitary ware have adopted new product launches and mergers & acquisitions strategies to strengthen their position in the market. These manufacturers are focused on enhancing their production capacities of ceramic sanitary ware products. Key companies profiled in this report include Roca Group (Spain), Geberit Group (Switzerland), Toto Inc. (Japan), RAK Ceramics (UAE), LIXIL Corporation (Japan), Duravit AG (Germany), Ideal Standard International S.A. (Belgium), HSIL (India), Villeroy & Boch (Germany), and Duratex S.A. (Brazil), among others. 11.7 Ideal Standard International S.A.
11.11.9 Shanghai Acquacubic Sanitary Ware Co. Ltd.
11.11.10 Cera Sanitary Ware Ltd.
11.11.12 Coto Ceramics Pvt. Ltd.